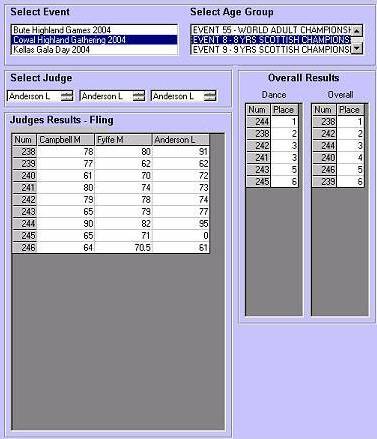 Highland Scrutineer has been designed for flexible and rapid management of competition entries. Highland Scrutineer's Windows interface gives you the power you need for fast, responsive scrctineering operation. Highland Scrutineer has been developed to automatically break championship ties, right down to six places. Highland Scrutineer lets you load competition data from any text delimited file or excel. Highland Scrutineer lets you split your age groups depending on number entered and age. Highland Scrutineer is built on top of Microsoft's powerful Access database runtime technology. No access license is required! Highland Scrutineer allows you to configure multiple classes (groups) each of which can have their own individual dance selections. Highland Scrutineer allows you to set the number of prizes to be be given in each class and scrutineers down to that level. Highland Scrutineer allows you to break down an age group into Overall, Highland and National winners. No more re-entering of data with changes in age groups. Highland Scrutineer lets you work with small data sets based on age ranges allowing you to to perform quick updates to suit your entry. Highland Scrutineer provides a powerful "Backup (export) and Recovery" of competition data. Take regular backups or use them for easy transfer of data to other computers or software packages. All reports can be viewed, printed, saved as HTML for upload to your website or even exported to Excel. Let Highland Scrutineer manage and print off all of your lineup report requirements. Let Highland Scrutineer manage and print off all of your callback report requirements. Highland Scrutineer comes with one year of email and online support included. All software upgrades during this period will be provided free of charge!